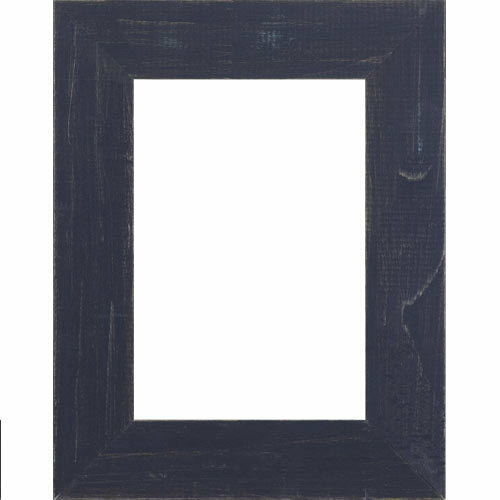 Transform your space with the subtle beauty of this rustic picture frame. Its flat, squared profile has a navy finish that shows the textured wood grain for a simple, modern presentation. A great Instagram frame, family photo frame or vacation photo frame. Handmade by our Artisans from natural wood grown in sustainably managed forests. Available in popular ready-made sizes. Your way every day: pictureframes.com. Fast shipping. Can this frame be hung on wall or only on tabletop? This particular SKU is only a tabletop, but if you are interested in this frame for your wall you can find it in pre-made sizes under the SKU 9BPW or if you need custom sizes you can search the SKU BP9 and input the custom size you need. We also just launched a gallery wall triptych consisting of 3 16"x20" navy backporch frames inclusive of acrylic front & foamcore backing and hanging hardware. You can find the gallery wall under SKU 9BPWG. If you have any additional questions do not hesitate to contact our friendly framing experts at 1-800-332-8884 Monday through Friday.